Scriptures: We have moved from a subtle to straight up obvious that Jesus is to fulfill the "Prophet's Life" by being put to death by his own people. The difference between Christ and Jeremiah, is that Jesus knows it is not only the path of the prophet, but it is also the path He must take to open eternal life to the world. 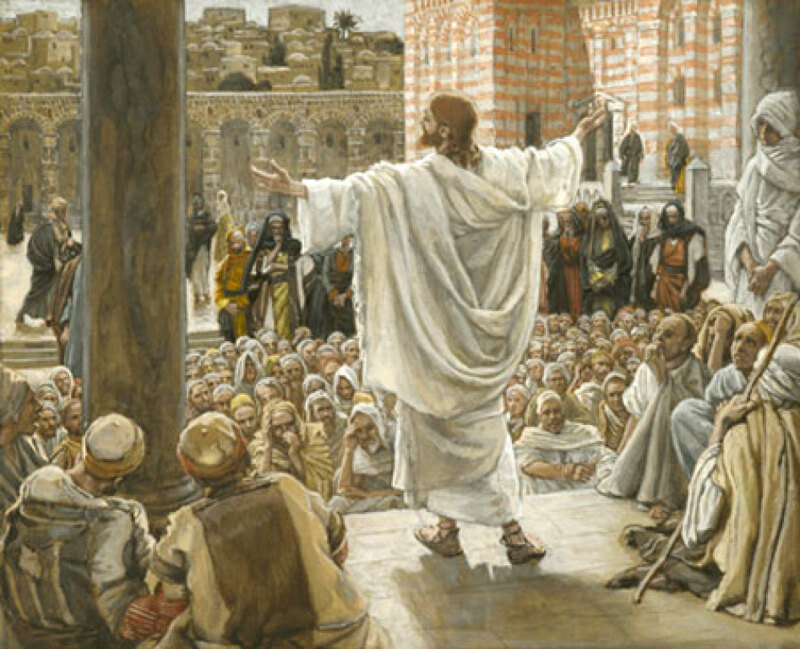 Jesus is bold and provocative because at what moment can you be the more clear and direct then at the moment where you are already condemned to die. Jesus begins to reveal plainly that he is the Son of God and that unless people believe in him, they will not have true life. They will have water but always be thirsty again, He offers drink from which we would never thirst again. Impossible to believe, he is crazy, he is a lunatic, that Guy thinks he is God... Well, wouldn't we say similar things to a person making similar claims today. We'd be rushing to push the command, "prove it!" Yet Jesus not only showed he wasn't crazy by his extraordinarily rational discourse, interactions, intelligence, and wisdom. He also proved that he could do great signs by healing the sick and casting out Demons. Thus, as you see in the Gospel today, the people were divided on what to think. It could be true, to say about an insane man, "nobody speaks like he does," but to make it an impediment to arresting him seems silly. However, "nobody speaks like he does," represents a fear of God and sure authority. Core Faith Principle: When we say our creed on Sundays, it is very easy to fall into the rote skill and pass by "in fulfillment of the Scriptures" without even a blink. What does that mean. The greatest proof that Jesus Christ was God is in the collection of all the most unlikely correlations. It will always be a matter of faith, but that is God's will, faith requires more from the soul than mere assent of facts. This is why we'll see, early in the Easter Season, the story of the Road to Emmaus, where the risen Lord accompanies some disciples fleeing Jerusalem. They do not recognize him in his glorified body. What does he do? Jesus explains how the scriptures were all fulfilled. To answer all the predictions for the Messiah in one lifetime the odds are astronomical. From being born in Bethlehem, to the descriptions of Psalm 22, the prediction of death, and so much more. Someone can come along and claim they are God. But it is an extraordinary feat to fulfill all the predictions made by different prophets over the course of 1500 years. Furthermore, a book could easily be written describing how Jesus fulfilled the other covenants God made with mankind. Living this at Home: The advice today is simple for the family. Go back to the bible stories, read and know the scriptures. A family that dives into the Word of God is much more likely to understand their faith differently. I understand this is a tough thing to accomplish, but if you must (rather than using a book of Bible Stories), you may have your children watch www.superbook.tv or play some of the games on the site. I fully endorse the content of the videos as they are as close to the Bible as you can get (obviously the moral lessons surrounding the kids and the robot are not scriptural) but they tell the story without allowing particular theologies to interfere.